Saab vows to make 54,000 cars this year. ZEEWOLDE, Netherlands (Reuters) -- Spyker Cars NV said production at Saab is on track, two months after the Dutch sports car maker bought the money-losing Swedish brand from General Motors Co.
Spyker also made clear its strong desire to develop a new, compact model for Saab if could find the right partner and the proper financing. Saab CEO Jan Ake Jonsson told shareholders at Spyker's annual meeting on Thursday that Saab would meet its target of 50,000 cars sold and nearly 54,000 produced this year. Jonsson said to meet these goals Saab would ramp up productivity in June beyond its original plan. Spyker bought Saab from GM for $400 million in February, taking on the challenge of turning two historically loss-making companies that have struggled to make money into one profitable global car company. Spyker CEO Victor Muller said Saab's break-even point should be sales of 85,000 cars a year by 2012; analysts have said Spyker must sell at least 75,000 cars a year to be cash flow positive. 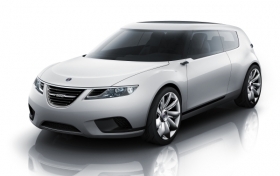 Saab debuted an entry-premium car concept called the 9-X BioHybrid at the 2008 Geneva auto show. Muller made clear he would like to expand Saab's lineup into the entry-premium segment, with something smaller than the 9-3 model. "The Saab 9-2 is clearly on the forefront of our priorities," Muller said during a news briefing after the shareholders' meeting, adding the market data in support of producing such a car was "irresistible." However, Muller made clear that to add such a car to its lineup, Saab would need substantial new capital and also a partner with whom to design and produce the car. He said the model would also have to stand out sharply from the other cars in the segment. "It has to be something as iconic as a Mini and it has to be a real Saab," he said. Saab debuted a concept for an entry-premium car at the 2008 Geneva auto show. ANE sister publication AutoWeek named the 9-X BioHybrid the best concept at that year's event. LIke Muller, Saab boss Jonsson wants to add a car to compete against the Audi A3 and BMW 1 series entry-premium cars. The car would be needed to help achieve Saab's stated goal of closing the gap with BMW and Audi. Saab's lineup will be completely renewed by 2012, which is when the company has promised it will be profitable and will be producing up to 120,000 cars a year, up from just 20,791 cars in 2009. The 9-5, which will compete against the BMW 5 series and Audi A6, launches this year. The 9-4X crossover debuts in 2011 and a year later comes an all-new 9-3, a rival to the BMW 3 series and Audi A4.